The rules are very flexible and don’t have to be rigid. In fact, the less rigid your rules the more fun you will usually have. Of course, many times you and your friends will be accustomed to playing with a specific set of rules, so it becomes easy to remember and you will have some consistency. 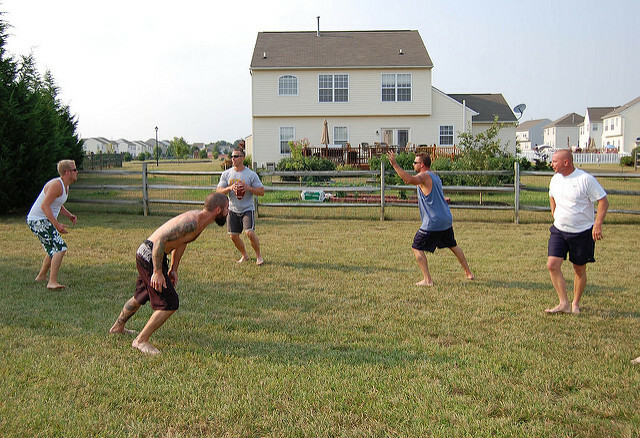 Most backyard players play until they get tired or until they score a certain number of points. Sometimes you can even play by limiting the number of possessions or drives that each teams gets and seeing who can score the most points. Most regulation football games are divided into four quarters, each consisting of 15 minutes of playing time. High school games are often shortened to 12 minutes per quarter, depending on your state. The first two periods constitute the first half of a game and the second two quarters make up the second half. Between the two halves, a rest period known as halftime, usually lasting about 15 minutes, is permitted. Of course, when you are playing flag football or backyard football, you rarely use such rigid and stringent time requirements. Sometimes games will go on for hours and sometimes they will end abruptly. In flag football, sometimes they use a specific number of plays to designate a half. For example, a total of 25 plays may be run during each half, with the referees keeping track. So the longer your team possess the ball, the less time the other team will have. In most backyard games, usually you pick two captains and then have them chose from the remaining players. The two captains are usually the two best players or two players that play equivalent positions. Like the two best quarterbacks would be a good choice for captains. Similar to pickup basketball when the two tallest players draft. At the beginning of each game, the referee tosses a coin in the presence of the two team captains to determine which team kicks off and which receives the kickoff. At the start of the second half, the team that kicked off in the first half receives the kickoff. 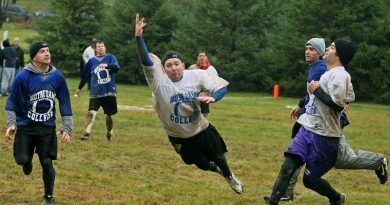 Flag football usually runs the same way as above. However, in most backyard football games the team that got the econd pick, gets to receive the football. Instead of kicking off, in backyard ball, you can have a player throw it to the other team. But in flag football you usually kick the ball off a tee. In the NFL, the kickoff is made from the kicking team’s 30-yard line. (In college the ball is kicked from the 35-yard line.) The kicking team lines up at or behind the ball, while the opponents spread out over their territory in a formation calculated to help them to catch the ball and run it back effectively. If the kick stays within the boundaries of the field, any player on the receiving team may catch the ball, or pick it up on a bounce, and run with it. As the player runs, the player may be tackled by any opponent and stopped; this is known as being downed. The player carrying the ball is considered downed when one knee touches the ground. Tacklers use their hands and arms to stop opponents and throw them to the ground. After the ball carrier is stopped, the referee blows a whistle to stop play and places the ball on the spot where the runner was downed. Play also stops when the ball carrier runs out of bounds. In backyard ball, tackling players on kickoff at full speed without pads and protective gear can be dangerous, so a lot of times, backyarders will play two hand touch rules on kickoffs and punts. Although, this is further away from “pure” football, it usually works fine, especially when you first start playing football. In most forms of organized football, offensive plays in football are run from a set formation known as a scrimmage. Before a scrimmage begins, the team on offense usually gathers in a circle, called a huddle, and discusses the play it will use. 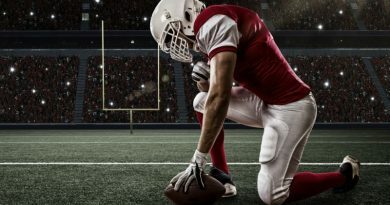 A coach either signals the play choice to the team from the sidelines, sends a play in with a player, or the team’s quarterback chooses from among the dozens of preset plays that the team has prepared. In backyard and flag football, teams usually huddle and call a play or discuss a strategy, then go ahead and execute it. When you have been playing with your friends for a long time, you begin to remember plays or give them names. A lot of teams that enter flag football tournaments will often have a playbook or a group of plays that they enjoy using. In organized football, the defensive team also forms a huddle and discusses how they will try and stop the opposing offense. Each play is designated by code numbers or words, called signals. After the teams come out of their respective huddles, they line up opposite each other on the line of scrimmage. If the quarterback analyzes the defensive alignment and decides that the chosen play should be changed, the quarterback can call an audible and shout out the coded directions for a new play. The defense can adjust its formation at this point as well. On the offensive side, play begins when the center crouches over the ball and, on a spoken signal, hikes it to the quarterback. Certain trick plays often involve silent signals and the ball is snapped without any sound at all, to surprise the defense. Based upon the chosen play, the quarterback can pass the ball, hand it off to a teammate, or run with it. During the scrimmage, the players on the offensive team may block the defenders using their bodies, but they are constrained by specific rules regarding the use of their hands or arms. 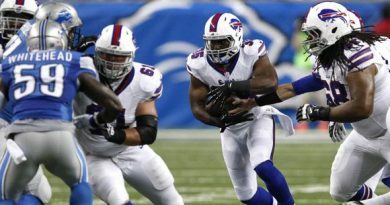 The player running with the ball, however, is allowed to use an arm to push off potential tacklers. Perhaps the most exciting offensive play is the forward pass, in which the ball is thrown downfield. The quarterback nearly always throws the ball, and backs, ends, and wide receivers may catch it. A forward pass may be made only during scrimmage, and then only from behind the line of scrimmage. A lateral pass (throwing the ball backwards or on a line parallel to the line of scrimmage) may be made anywhere on the field to anyone anytime the ball is in play. The defending team tries to keep the offense from advancing the ball, or to stop the offense for a loss by tackling the ball carrier before the ball carrier reaches the line of scrimmage. The offense must advance the ball at least 10 yards in four tries, called downs. After each play, the teams huddle and then line up again and a new scrimmage takes place. If the team on offense fails to travel 10 yards in four downs, it must surrender the ball to its opponent after the fourth down. A team will often punt on fourth down if it has not gained at least 10 yards in its previous three tries. In punting, the punter receives the snap, drops the ball, and kicks it before it touches the ground. By punting, a team can send the ball away from its own end zone, weakening the opponent’s field position. The defense can also gain possession of the ball by recovering a fumble or making an interception. A fumble occurs when a player in possession of the ball drops it before being tackled and downed. When this occurs, any player can then fall on top of or pick up the loose ball. An interception is when one of the defensive players catches a ball thrown by the offensive team. The defensive player who recovers a fumble or makes an interception may run with the ball toward the opponent’s end zone until being tackled and downed or forced out of bounds. In professional football, a player is considered downed when his knee touches the ground due to contact by the opposing team. In college and high school play, a player is down when his knee touches the ground, even if no defensive player has made contact.